I’m not talking about the usual jewelry-watch. Much, much more. 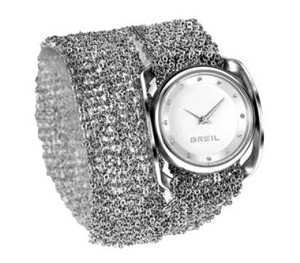 All with a simple gesture: just remove the case from the top and depending on the model, BREIL INFINITY turns to watch a necklace or a bracelet with double or triple spiral depending on the version. Three jewels in a fantastic (and – above all – the price of one)! Steel – undisputed – conquest softness and wearability of the fabric through the sophisticated knit called “mesh”. And thanks to this sorprendende adaptability and eccleticita mesh that allows the gem to indulge themselves with multiple wearing. Moreover, the clasp can be adjusted thanks to the rings depending on the extent and adherence that is preferred. The face of the watch, from very simple design is embellished with Swarovski crystals in the case that dot indexes and is available in different colors: black, silver or pink mother of pearl in the romantic nuance. An ode to the versatility and convenience for the modern woman and practice but do not give up being feminine, elegant and fashionable. How many times have we women were indecisive in front of a suitcase on which accessories / jewelery take on holiday? Also in this Breil Infinity won the pole position.